Loyalty depends on authentic connections with your customers. Get to know your customers better through social messaging. Immediately respond to customers who message you through Facebook Messenger or @mention your brand. Save time finding the conversations that matter most. Personalize your responses through insights from rich customer profiles. Collaborate with your team and make notes about customer activity. Reduce response times with push notifications that allow alerts to be delivered to the right staff members. Discover content and conversations within your location. Receive automated notifications for mentions, messages and specific activity. 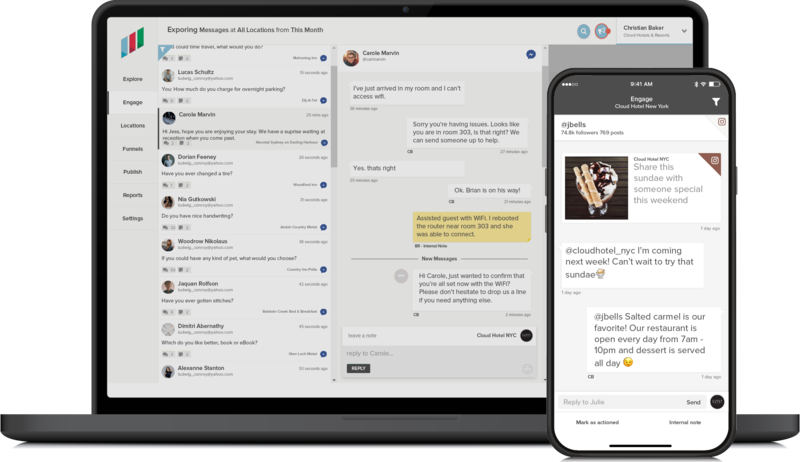 Manage conversations on multiple social channels through one platform. Identify service issues or opportunities to surprise and delight. By 2020, 90% of companies will be using social media for customer service. With Local Measure, Sydney Cricket & Sports Grounds were able to find out more about those fans and create truly memorable experiences. Dubai Parks & Resorts discovered they can cut costs associated with finding influencers, build brand loyalty, and increase their audience reach through Local Measure. Groupe Germain Hotels, a Quebec-based luxury chain, focuses on knowing the smallest details about their guests. After a brand-wide rollout of Local Measure, they’ve been able to double their guest interaction rate. Find out more about Engage.